The iconic Equinox Complex in Singapore is turning 10 this year, and it is celebrating with a bang with the return of the annual Chefs With Altitude from 23 to 30 October 2011. The week-long gourmet festival will feature the best in fine dining, mixology and entertainment. The event will feature the return of the illustrious Chef Bruno Menard to JAAN restaurant, where he will be presenting a special menu and helm an exclusive 9-Course Dom Perignon Vintages Dinner. The event will also ushers in a ground-breaking collaboration with Fifteen restaurant in London – three of their chefs, Dean McClumpha, Andrew Parkinson, Trevor Howard and Robin Soutar will present their signature Fifteen menu and culinary experience for diners and guests. Paying respect to 10 amazing years, The Equinox Complex is proud to announce “10 TRIBUTES TO 10 FABULOUS YEARS OF THE HIGH LIFE” at this year’s Chefs With Altitude with an array of premium events featuring a stellar list of chefs. Highlighting this event is the return of the famed Chef Bruno Menard to JAAN Restaurant where he will be showcasing his special menu on 24, 25, 26, 28 and 29 October and head a very exclusive 9-Course Dom Perignon Vintages Dinner on 27 October (which will be featuring some of the rarest Dom Perignon Champagnes). 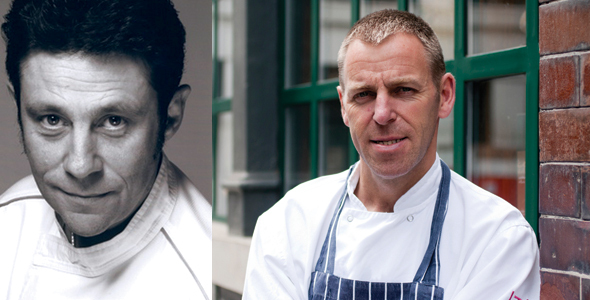 Chefs With Altitude 2011 will also usher in a ground-breaking collaboration with Fifteen restaurant in London. Developed by its inspiring founder and celebrity chef Jamie Oliver, several remarkable chefs will present their signature Fifteen menu and culinary experience for diners and guests at Equinox Restaurant from 23 – 30 October. They are – Head Pastry Chef Dean McClumpha, Executive Head Chef Andrew Parkinson, Senior Sous Chef Trevor Howard and Restaurant Manager Robin Soutar. “We are very honored and privileged to bring the team behind Fifteen restaurant to Singapore through this year’s Chefs With Altitude event. The philosophy and quality behind this magnificent culinary institution created by Jamie Oliver is inspiring, and the caliber of their Italian–inspired culinary creations is equally mesmerizing. We are confident that our diners at the Equinox Restaurant, which will showcase these talents’ specially-created menu, will be in for a truly epicurean experience,” says Mr. Nigel Moore, Director of Food & Beverage Service, Swissôtel The Stamford. For reservations and enquiries about the event, call +65 6837 3322 or email dining.reservations@swissotel.com.